My parents spent their honeymoon in Dublin, a weekend in the North Star Hotel in Amiens Street, just opposite Connolly Station. They enjoyed those two days. Free State food was good, compared with the rationed fare in the North, and they made sure they ate well. When they returned to Belfast, they went to live in Linden Street, renting two upstairs rooms. It was impossible to rent a whole house, and buying one was simply out of the question. The money wasn’t there. Life was hard enough. Their cooking facilities consisted of a single gas ring and an open fire. They had to go downstairs to fetch water and coal. Despite these inconveniences, they were happy. My father’s mother lived nearby, in 3 O’Neill Street, and proved to be a great help when their first child, Caitlín, was born in 1945. The house was filthy and ‘through-other’, as my mother might say. The fireplace covered in mounds of soot, the wallpaper peeling. No matter, it was a house, my father thought. It could be fixed up. He rushed home to tell his wife. She was delighted, impatient to see their new home. The Da managed to dissuade her until the place was spick-and-span. A painter pal, Liam Ó Maoláin, repapered the walls, painted all the doors and windows, cleaned the chimney. He only charged my father the price of the materials. My Ma and Da were proud of ‘tigh s’againne’—our house, a place they felt was theirs. The Irish for inside or in is istigh (is tigh)—in the house, within. And a teach is also a region or a kingdom. My parents were Falls people, with all that that entailed. Catholic people. Nationalist people. They belonged to a particular world with particular values. They had a framework that made sense of the world for them. In the ritual of the mass they were bound to their neighbours, to the world, to God. In the incense, the statues, the Stations of the Cross, the rosary, the stained glass, the Latin, they reached a form of communion and community that held up their daily lives. In this world the dead passed through a veil, simply gone ahead to another place where they waited behind the veil for their families and their friends. My Da believed this. One afternoon he told me if he’d been born in Iran he would have been a devout Muslim. Perhaps it was not so important to be a Catholic as it was to believe. My father was intensely religious. He carried his rosary beads everywhere. One fine summer’s day, he was delivering post on the Shankill Road. He was walking down Fortengale Street, where Billy Moore, the Grand Master of the Defenders of Ulster Lodge Number 796, lived. Outside his house, there was a group of Orangemen, dressed in their full paraphernalia: black bowler hats, dark blue suits and orange sashes. They were waiting with their banner and big drum for Billy to come out. The Da had a letter for Billy, and knocked on the door. Billy opened the door and said, ‘Ach, Wullie, come on in and have a drink.’ My father was known on the Shankill as ‘Wullie’ and it never occurred to them that a Catholic might be delivering letters there on the Twelfth of July, the day it happened to be. After another beer and a whiskey, my father was in full flow. As he was opening another bottle, he spilt some ale on his shirt. He put his hand in his pocket to get his handkerchief, and pulled out his rosary beads, which fell to the floor. Billy looked at the Da with shock. ‘Ach, you ould deceitful Papist,’ he said, ‘you never let on to me that you kicked with the wrong foot.’ So now the people of the Shankill knew my father was a Fenian, but they continued to be as friendly to him as they had ever been, and would often call on him to sing a song. 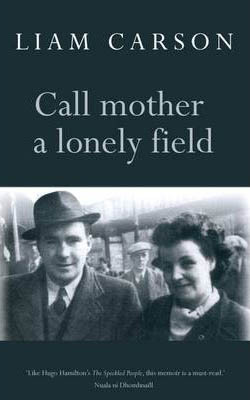 Extracted from Call mother a lonely field by Liam Carson (Seren Books), which was short-listed for the 2013 RSL Ondaatje Prize. © Liam Carson, 2010, 2012. Born in 1962, Liam Carson was educated in a Catholic school in Belfast before reading English literature and philosophy at University College Dublin. During the 1980s he lived in squats in London and worked in a variety of blue-collar jobs. Returning to Ireland, he worked for many years as a publicist for a variety of publishers. He is currently the director of the IMRAM Irish-Language Literature Festival, which he founded in 2004. His reviews, critical articles, essays and poems have appeared in a wide range of periodicals.